Today I will show you two "new to me" things, brazilian nail polish brand DRK Nails and US based indie webshop Psyche's Beau. DRK Nails created 3 store exclusives for Psyche's Beau, they were inspired by the nail polish Gentiliza Sempre, which was part of a previous collection. I was lucky enough to try out all 4 of them. 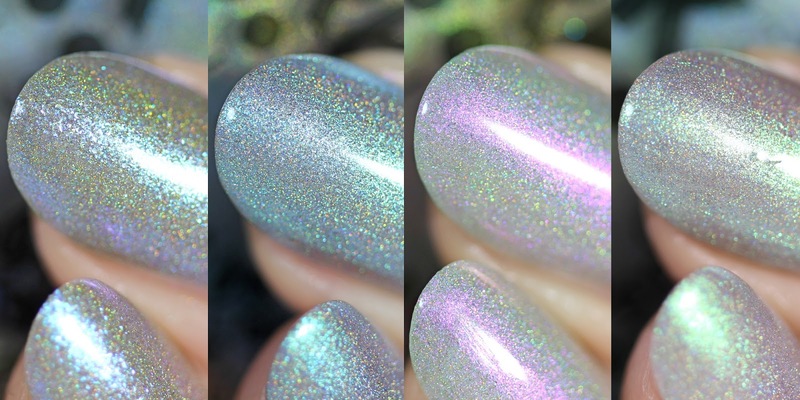 All of them has a holographic base that is packed with shifting shimmer. I thought these will be thin and will require a lot of coats, but I was surprised when all of these covered in just 2 easy coats, without any streaks, WOW! I have another Live.Love.Polish collection to share with you today, 3 glitter toppers. I used them over a black base. I used "about 1 coat" which means that I used them 1 times, but I had to dip the brush back twice to get the amount of glitter you can see on my pictures. Of course the bigger (and heavier) star, moon and circle glitters will require a little bit of fishing, that's just the law of physics, but the overall appliacation was quite all right. The newest additions to the Live.Love.Polish line are these color shifting flakie toppers. For me, 1 coat is perfectly enough, I swatched them on a black base, to show you the color shift the most accurate way, but I also made some combinations on nail wheels to show you how versatile these toppers can be. I really love them over hologlitter polishes! I have the latest Aliquid Lacquer collection swatched, it's called Fringe Events, and the colors were inspired by the series Fringe. I'm a huge Fringe fan, that series just spoke to my geek soul, so I was twice as excited to swatch these polishes. Live.Love.Polish has another holo microglitter collection, with 6 new colors. The formulation is still amazing, I needed only 2 coats of each, for a perfect coverage. Of course you will need 2 coats of topcoat to make the surface even, but it's totally worth it! Colors by Llarowe have a new collection right now, with a twist! The collection has two groups, mild and wild shades, and both category have a creme, a shimmer, a holographic and a topper.